Rush Run is a 1.5 mile long tributary of the Olentangy which drains approximately 2 square miles in Franklin County. Its natural flow has been channelized, and the streamside vegetation has been altered. Invasive plants such as honeysuckle and garlic mustard have crowded out native wildflowers along the stream banks in the residential areas, and turf grasses dominates the industrial areas. The water quality is listed as fair to poor. In 2006 the National Fish and Wildlife Foundation awarded FLOW a grant to restore a section of the streamside along Rush Run. FLOW selected a 408 foot section in Park Blvd. 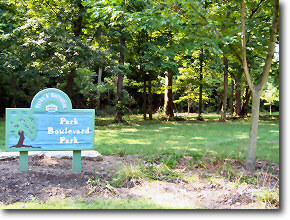 Park, in Worthington because it was heavily overgrown with invasive honeysuckle and because it was located on park land where it could attract public interest and participation. In its natural state, the streamside vegetation of Rush Run would consist of a balance of trees, shrubs, grasses and wildflowers. This vegetation would provide erosion control, shade, and a variety of habitats for wildlife. However, the Amur honeysuckle (Lonicera mackii) dominates the banks of Rush Run. Very few native wildflowers and shrubs can survive the crowding and shading. Introduced to the Midwest from Asia in the 1800’s as a garden ornamental, Amur honeysuckle has escaped cultivation. It spreads easily by seed, is fast growing, and is very adaptable. The Ohio Department of Natural Resources has more information on invasive bush honeysuckle. In the spring of 2007, FLOW and the Worthington Department of Parks and Recreation began to restore native vegetation. Volunteers contributed over 450 hours to clear the banks of honeysuckle and plant 94 native trees and shrubs, 50 ferns and over 900 perennial wildflower plugs. Volunteers also planted a seed mix of native floodplain species and watered and mulched the area throughout the dry summer. FLOW has compiled a list of plants used in this restoration (scroll down) and a gallery of photos showing the work accomplished. Volunteers monitored water quality before and after the restoration, and FLOW will be continue to monitor Rush Run at Park Blvd. Park in the future. An educational sign was placed on site in November 2007 describing the work accomplished at Park Blvd. Park. FLOW will participate in the upkeep of this section of Rush Run in the future. Watch for future workdays at Park Blvd. Park in the FLOW Calendar of Events. An educational sheet for class or scout visits to Park Blvd. Park is available, as well as information on what you can do to improve streamside corridors in your neighborhood. This project was funded by a generous grant from the National Fish and Wildlife Foundation. FLOW would like to thank the following organizations and individuals for their participation in making this project successful. The Olentangy River receives high volumes of stormwater at high velocity due to the impervious surfaces, such as parking lots and roofs that do not allow the water to soak into the ground. In addition to the “too much too fast” problem, the water entering the Olentangy River is polluted after travelling over roads and parking lots picking up whatever is in its the path. The lack of infiltration or ability to soak in the ground also causes streets to flood, basement backups and excessive erosion of streamside property. The solution is to restore the infiltration and the storage capacity with “green infrastructure”. Green infrastructure are structures such as rain gardens, infiltration trenches and rain tanks that allow rain water to soak into the ground, evaporate back into the atmosphere and/or remain stored to be reused later. FLOW created the “Soaking It In” program to engage the local public and city officials concerning the solution to the interrelated problems of a sediment laden Olentangy River, flooded streets, sewer backups and the loss of streamside property. The Columbus Mennonite Church (CMC) agreed to participate in the program to address sump pump issues and to demonstrate environmental stewardship. After receiving funding from Honda of America Foundation, FLOW and Urban Wild worked with CMC members to create a comprehensive rainwater management solution. With the help of volunteers, a rain garden, an infiltration trench and a rain tank were installed in the fall 2010. Combined these different structures will harvest or infiltrate approximately100,000 gallons of rain water per year from the 6800 square feet of the church roof. By keeping the water on site, the Olentangy River will not receive as much sediment and other pollutants. The rain garden and other structures are helping to restore the storage capacity that has been lost as a result of tributaries being culverted and wetlands filled along the Olentangy River. We hope that this demonstration project will encourage local officials and the general public to consider installing green infrastructure in public spaces and backyards. The “Soaking It In” program has been a success in large part because different partnering entities came together to make it work. Columbus Mennonite Church members Al Bauman, Phil Hart, Marlene Suter and Ruth Massey helped plan the project and provided logistical help that enabled the project to run smoothly. Amy Dutt, owner of Urban Wild, planned and coordinated the green infrastructure site design and implementation, as well as donated some of her time to see this project to completion. Other businesses who helped FLOW with discounted services were the Rain Brothers and Scioto Gardens. Volunteers from the local community helped by planting the rain garden and installing the infiltration trench. Ellie Nowels from Centipede Graphics created a beautiful sign that captures the entire project. Of course, this project would not have been possible without funding from the Honda America Foundation. 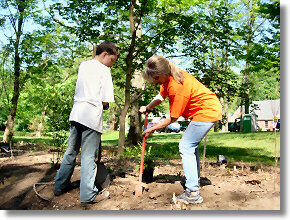 In 2011, FLOW looks forward to completing the project by installing one or two more rain gardens. Four blocks west of Colonial Hills Elementary School is a small neighborhood park at Park Blvd. and Granby. It is a 6.1 acre park with a grassy field and picnic tables. A stream called Rush Run divides the park. Forest trees and other dense vegetation border the stream. A bridge crosses the stream in the center of the park and you can follow a walking path beside the stream. What is new at the Park? In April 2007, FLOW worked with the Worthington Parks and Recreation Department to begin to restore native vegetation to the streamside. Volunteers worked along 400 feet of the streamside, removing an invasive shrub called bush honeysuckle. This shrub has escaped cultivation and shades out native wildflowers as well as native tree saplings. Honeysuckle does not provide the variety of habitat and food that wild animals need. In May, volunteers planted 94 native trees and shrubs, 50 ferns, and over 900 native wildflower plants! A seed mix of floodplain loving plants was spread over the ground. During the hot summer, volunteers and park employees watered the new trees. In November, a new sign explaining the restoration project was put in place by the bridge. The goal of this restoration project is to not only improve the streamside environment, but to improve the aquatic habitat as well. 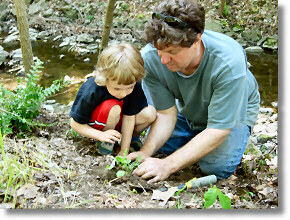 It will also serve as an example what Worthington residents can do to improve their streams. Bring your class for a nature exploration to Park Blvd. Park. It is a short walk from your school. Take an hour or an afternoon to explore. Please note: FLOW and Worthington Parks and Recreation will not be providing fieldtrip leaders for your visit. You are on your own. Please remember to practice “minimum impact.” Take only pictures and leave only footprints at the park. Thanks! Look at the colors and shapes in the winter. Can you find all the colors of the rainbow in nature during the winter? How does snow change the shapes of natural objects—logs, trees, hills, rocks? How does snow change outdoor sounds? Can you count the number of different sounds from nature you hear in one minute? Can you find the mammals or birds making the sounds? How many different kinds of animal tracks can you find? Note that many neighbors walk their dogs through the park so it is important to know what their tracks look like. A good track guide to use is A Field Guide to Animal Tracks by Olaus Murie or visit ODNR’s Species Guide. Compare the restored area to the unrestored area along the stream. Is there a difference in the activity of birds and animals in the restored area than the unrestored area, by sound, and by number of tracks? Look for the emergence of spring wildflowers. Many native species emerge in early April before the tree leaves emerge. Look for these species: Spring Beauty, Dutchman’s Breeches, Wild Geranium, Bloodroot, Virginia Bluebells, Blue Phlox and Golden Ragwort. Please don’t pick the flowers! For photos of Ohio Wildflowers visit ODNR. Streamside forests are great places to observe birds in the early spring. Look for American Robin, Carolina Chickadee, White-breasted Nuthatch, Tufted Titmouse, Downy Woodpecker, and Red-bellied Woodpecker. Use a field guide such as Sibley’s Field Guide to the Birds or visit ODNR’s Bird Species Guide. Compare the restored area and unrestored area along the stream with bird sitings and wildflowers. Your class may be interested in helping the Park and the Rush Run. In past years, classes have planted a tree for Arbor Day. To arrange a class conservation project, contact Jim Coffield or Shawn Daugherty at Worthington Parks and Recreation 786-7368. Funded by a grant from the National Fish and Wildlife Foundation.